Quantum Dot (QD) technology is now in a range of LCD displays, offering a wide color gamut (WCG) that is consistently bigger than that offered by OLED displays and other LCD technologies. When coupled with High Dynamic Range (HDR), these displays offer some of the best picture performance on the market. WCG and HDR displays are clearly the next wave of technology that is moving from the high-end toward mainstream adoption very quickly. In this white paper, we will provide an overview of the three main options to create a WCG display: OLEDs, quantum dot LED/LCDs and enhanced phosphor LED/LCDs. Then, we will take a deeper dive into the technology behind quantum dots, the various ways and places it can be integrated into LCD displays, along with the strengths and weaknesses of each approach. Perhaps the most exciting near term potential of quantum dots is their ability to become air stable and therefore embedded in the color filter array of the LCD display. This configuration will create a step change in power efficiency for LCD displays? Why, because current approaches use blue LEDs and quantum dot to generate white light at the backlight, which is then modulated by the LCD and filtered into red, green and blue components by the color filter array. If the quantum dots are placed in the color filter, only a blue backlight is needed with conversion to red and green light happening in the color filter. This could reduce power consumption by one-half to two-thirds. And, quantum dot technology has applications in many other markets such as solar cells, biomedical, instrumentation, quantum computers and more, thus providing a rich source of additional technology investment and innovation to feed the display industry. 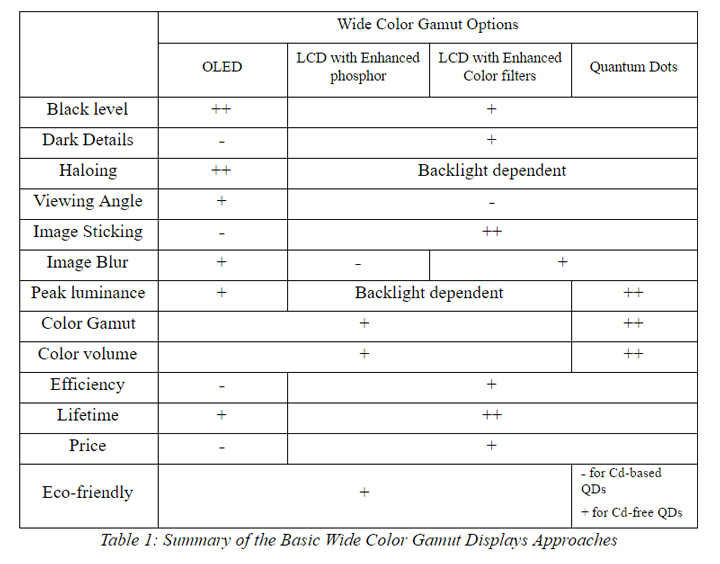 As will be discussed in this white paper, Table 1 summarizes some of the main features of the basic display approaches to generate wide color gamut displays. Quantum dot technology seems to offer the biggest color gamut of the various approaches today. Table 2 summaries the known suppliers of QD materials along with their partners. Wide Color Gamut is a generic term that in fact, has no clear definition in the display industry. Currently, a display is considered to be WCG if it has a gamut in excess of the Rec. 709 color gamut for video applications or beyond sRGB color gamut for printing or web-based applications. In reality, Rec. 709 and sRGB share the same RGB primaries, but use slightly different gamma curves to describe the steps between the various colors and gray levels. 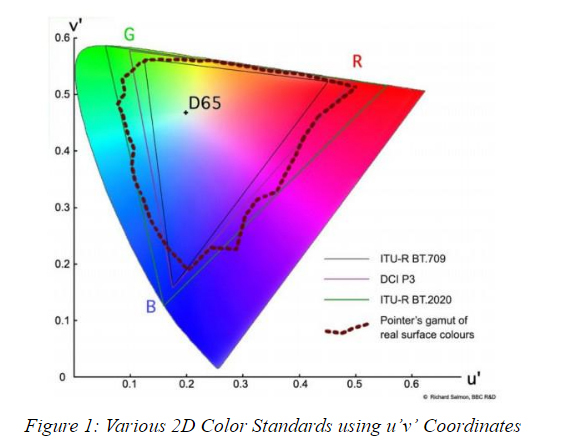 The ITU has ratified a new standard called ITU-R BT.2020 that specifies a new color gamut for UHD TV that is generally referred to as “2020.” It expands the range of colors considerably beyond the RGB primaries of rec. 709/sRGB. The 2020 spec is a “container” that includes new coefficients for defining colors. While many camera systems are capable of capturing at or close to the full 2020 color gamut, display systems are generally not capable of displaying the full 2020 color gamut. For video content, the 2020 specification does not require content to be captured, mastered and delivered with the full range of colors – it just requires the content use the 2020 color primaries and description coefficients. Since most flat panel displays do not achieve the full 2020 color gamut, mastering of content is often done in a smaller color gamut. So far, most are choosing the DCI-P3 color gamut to master content aimed at the home. This is the same color gamut used to master for theatrical releases as well. This color gamut contains a range of colors that is in between rec. 709 and BT.2020. These color gamuts, along with “Pointer’s gamut” are shown in Figure 1. In discussing the color performance of a display, one must always ask what “mode” it is in (standard, cinema, vivid, etc.) and if the display has been properly calibrated. Calibration is typically done in a reference mode which can carry different names depending upon the brand (cinema or movie is typical). Calibration for SDR and HDR content needs to be done separately as well. Calibration tunes the TV to help ensure it reproduces the most accurate colors, white point and gray scale that it can. SDR calibration would ensure colors are accurate for the rec. 709 color gamut, but color calibration for HDR content is different. Here, standards are still emerging. One can always measure the color performance of the display, but what it should be calibrated to is an open question. For example, should the TV be calibrated for the full BT.2020 color gamut and have colors that track from white directly toward these 2020 primaries – even if the display can’t produce those primaries? Or, should the TV be calibrated to the DCI-P3 color gamut with tracking from the white point to the P3 primaries? This sounds more logical as most content is being mastered to the DCI-P3 color gamut, but either approach may yield incorrect colors (P3 content on a 2020 calibrated display or 2020 content on a P3 calibrated display). Ideally, HDR content will have the metadata that will describe the color primaries it was mastered to allowing the TV to go into the proper calibrated mode to display those colors accurately. Other modes are set by the manufacturer and often move the white point (usually toward the blue) to get more brightness and sometimes more colors. Some consumers prefer these modes but they will not accurately reproduce what the content creators intended. Another issue with discussing color gamut is “coverage”. Figure 1 shows a 2D representation of color gamut and the performance of the display can be shown on such diagrams. However, color representation is really a 3D volume, so the 2D diagrams of Figure 1are only valid at one luminance level. Methods to characterize the color volume of WCG displays exist, but have not been widely adopted by the display or TV industry. As a result, most descriptions of the color performance are limited to specs such as “100% of P3” or “91% of 2020”. There are several additional issues with such descriptions. First, if one manufacturer described coverage as a % of P3 and another as a % of 2020, there is no easy way for consumers to easily tell which color gamut is larger. The industry should consider a recommended best practice to choose one or the other for more easy comparison. Secondly, “percentage of coverage” can refer to two types of coverage. Does the display cover 100% of the area of the P3 color gamut, for example, or does it cover 100% of the P3 gamut. These are quite different measurements as illustrated in Figure 2. In this case, the area of P3 and the area of the measure display color gamut are identical, so a display maker may report “100% of P3.” However, the RGB primaries of the measured display gamut do not align with the P3 primaries. The common area of the two (textured portion) is the other way to report “gamut coverage” and in this case may only be perhaps 90% of P3. Again, the industry should consider a recommended best practice to choose one method for common reporting for better end user comparison (preferably the percentage of gamut metric – either P3 or 2020). 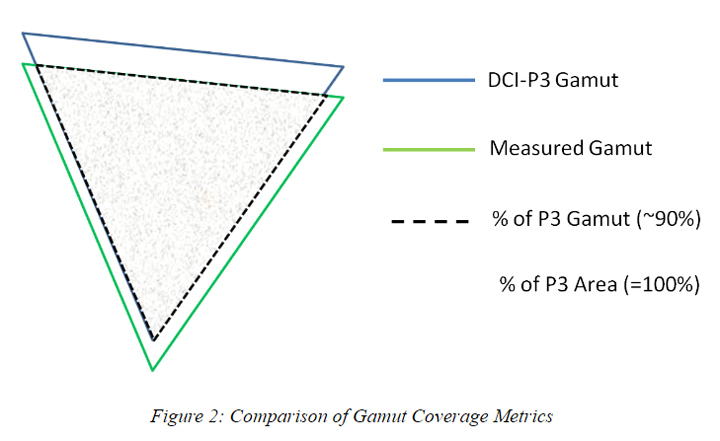 This issue of percentage of coverage assumes a continuation of the 2D color gamut description. But since color is a 3D parameter with luminance being the other parameter not part of the 2D description, moving to a color volume representation may be desirable as well. Again, there are methods to describe color volume today but the issue of volume of a gamut or just a volume number is an area of discussion. Since these discussions will take time, perhaps the industry can first agree on 2D color coverage best practices while discussion color volume best practices. Finally, we have the issue of color accuracy. One common method is to use the ΔE 2000 metric. Most agree that a ΔE 2000 measurement of less than 1 means the presented color is indistinguishable from the absolute correct color. In reality, displays that show color performance across most colors with a ΔE 2000 of less than 3 are considered to be very good and well calibrated.